With only a few words changed the above could easily be taken for the opening of one of those ‘comics are no longer for kids’ articles that pop up from time-to-time in the mainstream media. However, as you have probably guessed, this is not where it hails from. Rather, it was written by the American Richard Kyle in the editorial for the first issue of Graphic Story World (GSW), in May 1971 – nigh on 35 years ago! I have used it here because the sentiments expressed, both this in extract and GSW itself, are relevant to the contents of this issue and the philosophy behind Word Balloons in general. The positivist tenor of Kyle’s text may, in the light of the less than glorious path that the medium has taken since, seem a little quaint. But as well as perhaps an optimistic mien Kyle was simply picking up on the zeitgeist of his era. There was a belief abroad that far more than the graphic story had come of age and many expected the whole of western culture would soon be morphing into something more liberated. The reasons why neither society nor comics changed as much as expected are many and more than I can adequately handle here. However, the issue of the development of the medium will be an ongoing theme of the magazine as it has been an issue of enduring interest to me. Apart from all of this I have mentioned GSW because I have resuscitated the issue of the term ‘graphic story’ as a synonym for ‘comics’. According to Paul Gravett (in his book Graphic Novels – stories to change your life, Aurum 2005) it was Kyle who came up with both the terms ‘graphic story’ and ‘graphic novel’. I’ve always liked the former, despite the fact that some have seen it as pretentious. The problem with ‘comic’ is that it neither fully describes the medium (which isn’t all funny) and is also another term for ‘comedian’. I know that I am stretching the pretentious banner by the use of the by-line ‘graphic story arts’, but this, again, was the subtitle of GSW and the term ‘comic arts’ very much puts me in mind of the craft of being a stand-up comic. Over the course of its four year run (1971-74) GSW championed the cause of international comics especially those from France. The Australian fan John Ryan was their Australian correspondent and handled local subscriptions. It was undoubtedly as a direct result that I came into contact with French comics at Space Age Books (see the My Life in Comics article this issue). This interest led to a friendship with Colin Wilson, the subject of this issue’s interview. See how everything is related! 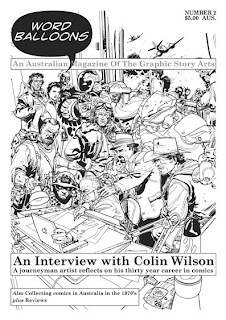 In the world of the graphic story Colin Wilson occupies an unique position. Born in New Zealand, a country which has had little in the way of an indiginous comic industry, he nevertheless found himself drawn to working in this field. Rather than aspiring to the USA, as has been the norm in Australia and New Zealand, though, he was attracted to the European market on the strength of the diverse and literate comics produced there. Turning a wish into reality, he moved to Europe in 1980 where through a combination of luck and hard work he ended up drawing one of France’s most popular characters, the Western hero Lt Blueberry. Since the mid-1990s he has lived in Australia, working on projects for four of the worlds largest comic markets: UK – Judge Dredd & Rain Dogs, France – “La Plombe du la Tete”, Italy – “Tex”, and America – Point Blank (with Ed Brubaker), Battler Britton (with Grant Morrison) and Star Wars: Legends (with John Ostrander). "No-one really told me to go out and get a 'real' job." An interview with Colin Wilson Part 1. Conducted by Philip Bentley May & June 2003, January 2004 and updated before publication. PB: You jetted out of New Zealand in early 1980 with your first port of call being London. CW: Yes, I stayed with friends for first few months. When the money began to run out I started to think about how I could support myself to stay there longer. I had made contact with Martin Lock, the editor of the British fanzine Fantasy Advertiser. He suggested that I should try out for 2000AD, which, believe it or not, I had never heard of. He put me on to one of their artists, Brian Bolland, who looked at my work and thought I could make the grade there. He invited me to accompany him next time he visited them to deliver work. They liked the look of my work and gave me a ten page Judge Dredd strip as a try out. It went over well enough, but the initial plan was that it would not be printed until the 1982 Summer Special and it was then the end of 1980. Thankfully, they got back in touch early in 1981 and I was soon doing some one-off strips [“Future Shocks”] for the weekly magazine. I certainly wasn’t making a living out of it though and was doing other odd-jobs like making deliveries. PB: I think you wrote at the time that you worked on the ten page strip for 106 hours over three days with six hours sleep. CW: Kids, don’t try this at home. [Laughs.] Thankfully, its publication was brought forward and it appeared in the 1981 Summer Special. That was my first printed work for them. Later in the year came my big break when a Judge Dredd story regarding riots [“Block Wars”] was pulled due the race riots that summer, and they asked me to do a replacement strip at short notice. PB: Then you graduated to Rogue Trooper which Dave Gibbons had started. CW: Yes. They were looking to create a character to rival the popularity of Judge Dredd. Dave did the character designs and as many of the initial run of stories as he could handle. Dave and I then alternated for a year or so before we both became a bit jaded with the strip. Dave felt it was going places that he wasn’t interested in so he left. Both he and Brian Bolland were more interested in working in the States, which they subsequently did. [Bolland on Camelot 3000 and Gibbons on the Watchmen.] Meanwhile, I was still interested in working on the Continent and couldn’t understand why none of these guys didn’t want to do likewise; they were so close in terms of distance. What I underestimated was the impact of American comics and how Britain was culturally far closer to America than France. So the plan was to go to France and start knocking on a few doors. By this time my partner, Janet [Gale], had arrived from New Zealand. We were living in a squat, having friends from New Zealand stay with us, and seeing them dragged away and put on a plane for overstaying their visa, while I was hiding in a closet upstairs. So we needed to take steps to realise my ultimate goal. At the beginning of 1982, we got the opportunity to stay in a friend’s apartment in Paris, so we left London and for the first six months I continued to work on Rogue Trooper. PB: How did the Lt Blueberry venture come about? CW: François Cortegianni, who was another writer for [publisher] Glenat, had shown some of my pages of Rael [Colin’s first French comic album] to [artist on Lt Blueberry] Jean Giraud and told us that he was interested in meeting us to discuss working on something together. As it sounded too good to be true we were initially sceptical. And in fact the meeting took more than six months to occur in September of 1983. By this time the motivation had moved to [Lt Blueberry writer] Jean-Michel Charlier as it looked like Gir was going to be moving to Tahiti. Thus the prospects for Blueberry were a bit unclear. A new publishing company, Novedi, and magazine, Wham, had been formed in Brussels around the work of Charlier. The plan was for them to be the sole outlet for the number of popular series he was producing. Given that financial stability was paramount the last thing they wanted was for Giraud to become unavailable. So the publisher and Charlier were looking for some way to ensure a constant Blueberry presence in the market. They hit upon the idea of resuscitating the “Jeunesse de Blueberry” [Youth of Blueberry, a series of shorter stories produced in the late 1960s]. PB: You were no doubt unaware of the publishing moves in Brussells when you went for the interview with Charlier. CW: Completely unaware. We thought I was going to be offered a short story or something. Instead, Charlier and Gir offered me Jeunesse. I initially declined because I was so overwhelmed by the concept of embarking on a whole spin-off series of my own. PB: Especially as it was working in shadow of the artist you idealised above all others. CW: Absolutely. The exact words I would use. And with the added disincentive that he wasn’t going to be around. [Laughs.] He was going to be living halfway around the world in the Pacific, rather ironically. I was taken aback and a little bit frightened by the prospect. And it was only through a lot of elbowing and kicking under the table from Janet and François Cortegianni, who was also at the meeting, that I realised that I was being made an offer I couldn’t refuse. The rest of the interview covering Colin’s youth in New Zealand, his involvement in the seminal NZ comic, Strips, and his first French album Rael can be found in Word Balloons 2. This is the second of a series of articles chronicling my path as a comics aficionado in Australia over the past forty years. These articles have been inspired partially by a sense of nostalgia, but also to record certain aspects of the local comics scene for posterity. Primarily these are my recollections alone and make no claims to be the authoritative view. In Part I, I detailed my path collecting comics in Melbourne during the 1960s. In December 1969, however, changes in my interests and the comics themselves saw me give up collecting. For two years I occupied myself with other pursuits, but inexorably I found myself returning to the fold. A major difference in the form my collecting took at this time was that, whereas previously my emphasis had been principally on Marvels, and more to the point the storylines, now I was more interested in the art-work. I was particularly drawn to comics and creators who were trying to push the envelope of the form. At this time there were quite a few whose agenda was to do just that. Beginning in the late 1960s, with artists like Jim Steranko and Neal Adams, there was an influx into the field of younger creators with high ideals and often talent to match, such as, Barry Smith (later Windsor-Smith), Berni Wrightson, Mike Kaluta, Howard Chaykin, Jim Starlin, Richard Corben et al. Many of them had come up through contributing to amateur and semi-professional comics and the then burgeoning underground comix movement. Their path at the majors, though, tended to be more transitory as their idealism came up against harsh publishing realities. Comic distribution through newsagents during the 1970s remained similar to the previous decade, with comics on sale on Fridays and distribution erratic. With the surfeit of new titles being published the unpredict-ability of the local release of initial issues became more annoying. Very occasionally a title would begin with the first issue, such as Jack Kirby’s Kamandi (DC) in 1973, but generally it would take three to five issues for new titles to be locally released. There were also some strange anomalies, such as all three of Kirby’s Fourth World titles (New Gods, Forever People and Mister Miracle), and later, X-Men 120, 121 and 125 (1979), all of which had very poor distribution. Whilst most DC superhero titles continued not to be released, as they were subject to local reprints, a smattering were, and more appeared as they expanded their line. However, the principal change to the collecting process at this time was the arrival of Space Age Books, established by long-time science fiction fan Merv Binns and located for most of its time in Swanton Street, Melbourne. To a naive kid from the ‘burbs, Space Age was a passport to another world – a dim, incense-filled Aladdin’s cave of wondrous delights. SF occupied the left hand side of the shop, with books generally referred to as from the ‘counter-culture’ (alternative ideas/lifestyles, drugs, mysticism etc.) on the right. Comics got a look-in, albeit on racks and shelves surrounding a pillar at the back of the shop. Whilst the great advantage of Space Age was that they imported limited quantities of new comics directly from the States, and hence carried copies of non-distributed titles, there was never any sense of reliability about the operation. Thus it was common for only between one to five copies of any given title to go on sale. Space Age also began to buy and sell second hand comics charging then current new comic prices (20c) for them, rather than half cover price as was the standard at second-hand shops. Imported new issues commanded an even greater sum (25c or 30c) and premium imported back issues of, say, Conan or the New Gods, might be as much as 50c! To read the rest of the article purchase Word Balloons 2. Also reviews of Dylan Horrocks’ Atlas 2 “another deftly told tale full of intriguing characters and intersecting narratives” and Butcher & Wood’s Pox 6 “a cleverly contrived commentary on many aspects of life and popular culture”.